As you know, we are always striving to keep things fun and interesting around here, so today we're excited to introduce a new feature on the blog - Book Nook! Every other Wednesday, we'll feature a sewing-related book that we love. And, since we love prizes, we'll give away a copy of the book too! For our first "Book Nook", we've chosen Modern Log Cabin Quilting by Susan Beal. Susan has authored or co-authored several books, and is currently the president of the Portland Modern Quilt Guild. Susan starts the book out with a little history lesson, then goes over all of the basics that you'll need to know before you get started - choosing and preparing fabric, the tools you'll need, and even tips on organizing your stash & choosing needles. The projects are coded as to degree of difficulty, which will make it easier for you to choose one that you'll be successful at! There's a cutting key and assembly diagram for each project, which we think is a nice feature. The projects are gorgeous and include more than just quilts - there are instructions for bags, potholders, and pillows too. We think you'll enjoy this book as much as we did, so Potter Craft is generously donating a copy for us to give away! Leave a comment here telling us why you'd like to win it. Make sure the comment also includes your first name, last name, city and state so we can find you. Deadline is Wednesday, May 2nd, 2012 at 5 pm Eastern time. For more great books, be sure to check out Crafternews.com. 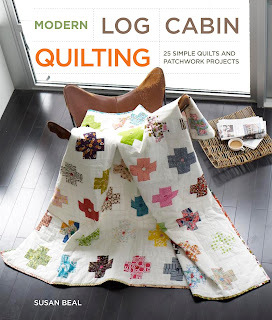 Log Cabin Quilts are my absolute favorite so I would love to try the "modern" patterns in this book! Would love to win! Would love to see her variations on the traditional log cabin. Would be a nice teaching tool since am teaching my 2 girlfriends to quilt. Thanks for the opportunity. I'm fairly new to quilting and the words simple quilts is just what I need! Susie Gerdes - Wheatland, Ca. Hear, hear, Susie! I have yet to tackle Log Cabin but it's in my line-up! Log Cabin is my favorite, and I'm planning a Log Cabin project for the summer. This book would come just in time! I love anything to do with quilting, and Love bright colors. I fell in love with quilting with a log cabin quilt lap quilt project! After many years of stitching quilts, this book would revive my idea bank for the next project! I would Love to have it on my cutting table. I just started quilting with my new machine I got for Christmas. I tent to lean toward the modern fabrics and patterns. This one I would like try. This is just the inspiration I have been looking for. Should someone else win, I just might have to buy a copy. LOL. Thanks for the review, and I think I'm going to love this Book Nook feature! Looking at this quilt reminds me why I quilt. It's fresh and fun. I know I'd put this book to good use. I've been collecting fabrics for years to make my son and his wife a black and white log cabin quilt. I would love to see the modern patterns to inspire me to actually start cutting all that material. Love the look of the new Modern Log Cabin - would love to try it. I love log cabin quilts. My grandmother had made one for me and it was in rags before I would give it up. I would love to make a modern log cabin for my grand children when they arrive in the future. I absolutely love log cabin quilts. I could put this book to good use. Would love to have a book about log cabins! Haven't made too many yet. Log Cabin is my favorite. My first major project was a king-size comforter in yellow and blue. The pattern was Log Cabin in the barn-raising arrangement. I've looked at this book online and would love to explore its other takes on my favorite block. I would sooo like to win this book. I have a collection of fabric but not brave enough to start cutting. Hopefully the cutting key would give me some must needed confidence. I have made several log cabin quilts, potholders, bags. It is my favorite block. Would like some new inspiration. Sounds like this book is just what I am looking for. I have made a lot of log cabin quilts, but the quilt pictured on the book cover certainly shows a different twist on that pattern! I love the idea of trying a new 'twist' on on a traditional pattern. Oooh, love the look of this book! I too like a to have diagrams and levels of difficulty to refer to when I start a written project. This book sounds challenging with a variety of projects. I would love to have this book because I need simple, quick easy projects to do and have been wanting to try something a little more modern than I have done before. I'm always interested in learning new techniques and sewing different styles. Thanks for the chance to win the book! I love Log Cabin quilts, but I have a hard time keeping my seams exact. I would love to try Susan's method and see if it would help. Log cabins are a fun way to make an unique quilt, i would like this book for my grand daughter who has just started quilting. I haven't tried making a log cabin quilt before and I'm sure this book will give me a lot of inspiration. Thanks for this chance of winning this book. Wow! Looks like a wonderful book! I've never made a log cabin block or quilt and would love to make one! Thanks for the chance to win! Ooops! Forgot to add that I'm from Sudbury, Ontario Canada! I'll read anything Susan Beal writes! :) And...I have yet to try log cabin quilting. It's time. I will also read anything Susan Beal writes :) This one looks amazing! I'd love to win this for my mom! She's the quilter! The Log Cabin Block is one of my favorite blocks. I'd love to learn new techniques and styles of the block. Def would love to win this as I just got a NOOK for Christmas & haven't tried any quilting books yet! And I would love to learn a log cabin pattern too! I like the new Book Nook feature. it's always fun to find new books. I have always been intrigued by the log cabin as there are so many variations to it. would love to win this book, thanks for the chance. Love the quilt and would love a copy of the book. I don't owe one copy of a quilting book (I know bad of me) .... Thanks for the chance to win. Log Cabin Quilts are my absolute FAVORITES, though I have only completed one in my years of quilting -- and it was triangle Log Cabin blocks. I lost my quilt stash and some of my books in the Bastrop, Texas wildfire September, 2011. So, I'd LOVE to have this book! That quilt is just so beautiful, refreshing and eye catching. It would be awesome and inspirational to have a copy of this Modern Log Cabin book. How fun! I am always looking for great books that inspire quilters. What a beautiful book! Would love to win. I use my nook all the time. I would love to win this book. Log Cabin Quilts are my favorites. quilting library. As a fairly new quilter I love learning new blocks. I haven't tried log cabin blocks yet, but I think they are beautiful. Maybe with this book I would get the knowledge I need to tackle them. I saw this book at the store and fell in love. I would love to add it to my collection of crafty books. Thanks for the opportunity. This looks like a FUN book! Would love to read, try and share! 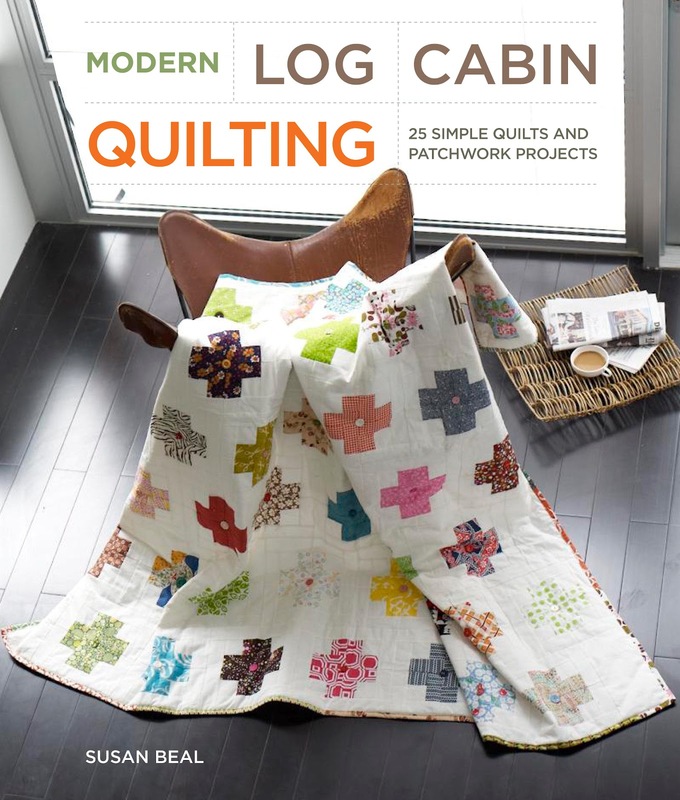 Have always loved log cabin quilts & would be thrilled to win this book.